Ubisoft have unleashed another teaser trailer for the upcoming Rainbow Six Siege Operation Para Bellum, offering a flavourful preview of what to expect from Alibi. It’ll seem familiar if you’ve seen any of the previous leaks, but it does confirm what to expect. The teaser suggests that she’ll be able to deploy multiple holograms, and the ability may require her to be stationary to be effective, though how much of that is reflective of the in-game ability and how much is there just to look cool in the trailer remains to be seen. 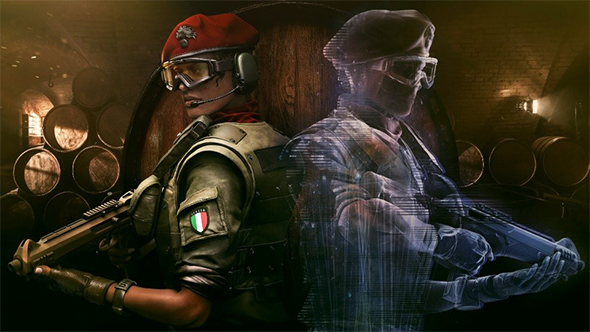 Alibi’s real name is Aria de Luca, a Libyan immigrant now employed among Italian special forces. She eventually joined a unit specialized in fighting organized crime, and after years of work successfully took down one major family from the inside. You can see more of her backstory at the official site. With teasers for Alibi and the Villa map now available, it’s a pretty safe bet that a trailer for Maestro will soon be on the way. Everything we have left to know about Para Bellum will be officially unveiled during the Pro League finals on May 20.